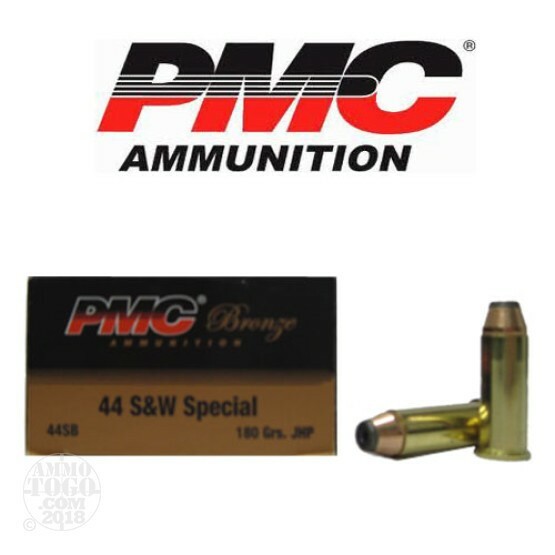 This is 44 Special PMC 180gr. Jacketed Hollow Point Ammo. This long popular ammunition line makes it possible for budget conscious hunters and riflemen to go afield with plenty of ammo or enjoy high volume shooting with military ball style ammo without emptying their respective wallets.The same quality and dependability built into PMC Starfire ammunition is incorporated throughout the extensive line of PMC training ammunition and standard hollow point or soft point ammunition. All PMC cartridges must pass through the rigorous inspection of our electronic powder check station. This station accurately measures the propellant charge in each round. If the propellant in any cartridge varies by a tiny amount - just two tenths of one grain - the system stops and that cartridge is discarded. No other ammunition manufacturer can truthfully assure you greater uniformity and reliability than PMC! The exposed lead at the tip of the PMC jacketed hollow point rapidly initiates uniform, controlled expansion that progresses to the depth of the hollow point cavity. Penetration is also controlled for maximum energy transfer to the target, assuring its suitability as a hunting bullet. Excellent accuracy and bullet integrity. This ammo is packed 50rds to a box, 20 boxes to a case. Muzzle Velocity: 980fps. Muzzle Energy:383lb/ft. This ammo is brass cased and non-currosive.